... is a coach of the Tagesschau and enjoys the trust of many television speakers and moderators. In addition, she works as a voice and speech trainer for corporations in Germany and abroad. After finishing her studies as a diploma spokeswoman and diploma spokes educator at the State Academy of Music and Performing Arts in Stuttgart, the native Hamburg woman has been working as an independent speaker since 2008. Simone Dorenburg herself regularly performs as a spokeswoman on television and on stage. ... is an English teacher from London who specialises in Business English with a focus on enhancing your business skills. Do you need to make presentations in English? Do you find telephoning difficult? Would you like to be better at networking and making small talk? He has been teaching bankers, engineers, doctors, accountants and many others and he can help you to improve your English. He is based in Berlin and can visit your location here to work with you or you can have your lessons via Skype. ... is a freelance journalist and moderator. She wrote columns for „jetzt.de“ and „Zeit Campus“, developed the first German edition of „Wired“ and was a reporter for the young TV magazine „Klub Konkret“ (EinsPlus/ARD). Afterwards, she spent half a year as a „Trialogue of Cultures“ Fellow in Jerusalem and Tel Aviv. In 2009, she got motioned in the „Medium Magazin“ as "Top 30 to 30". Schulz has her own Snapchat format at Funk, the online format of ARD and ZDF. She studied communication, culture and business at the Zeppelin University in Friedrichshafen and wrote her dissertation on the prevention of innovation on public television. … is a TV moderator and reporter of the KIKA media Magazine “Timster”. On the Children channel of ARD and ZDF, he weekly discovers the world of media looking critically behind the scenes and inspiring to use digital tools and media in a creative way. In 2017, together with his Team he won the renowned “klicksafe Prize for security in the internet”. Tim Gaius studied media management and political communication in Hannover and Berlin. With his scientific work, he toured all over Germany as a science slammer. 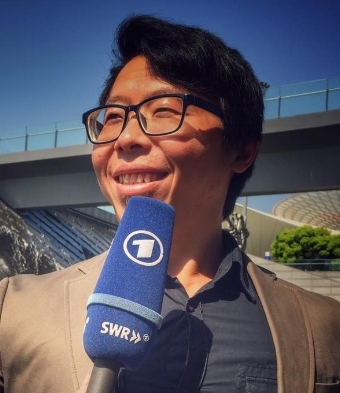 He supported various companies in the field of external and internal corporate communication and gained journalistic skills at NDR, Sat1, RTL and at the radio center Kiel. Tim Gailus is audio book Speaker at Hörverlag and ambassador for reading at Stiftung Lesen. He runs media workshops and has been active as knowledge youtuber and founder of Campusradio. … is a graduate engineer (physical technology in Aachen an Coventry, England) and has years of practical experience in leading positions in medical technology and in the NPO Environment of McKinsey (i.a. startsocial). As a dvct-certified business Coach and a freelance Consultant in the field of human resources devolopment, Monika Kayser is engaged in the key issue communication: How can the communication effect of one’s own or of the team be increased? How can misunderstandings be avoided and cnflicts be solved? In this context, the native of Hamburg accompanies and trains people in organisations and in processes of change. ... is a native Iranian with Swabian roots. She lives since more than 30 years in Cologne. This diversity is reflected in her language skills and her professional experience. She communicates in German, English, French, Italian and Farsi. She studied German and French to become a teacher at the University of Tübingen. Her professional repertoire ranges from teaching languages and assistance to the management to the organization of art exhibitions. She is responsible for the back office of Johannes Büchs. … is a journalist and producer at ARD Shanghai studio with a focus on business reporting and cross-culture communication. Having an academic background in literature and journalism, he has worked in the media industry for more than 13 years. During this time, he interviewed hundreds of political, business and community leaders and spoke on many occasions to reporters, companies to academies. His strength lies in the effective communicational skills with the audience, independent of their cultural and professional backgrounds. Based in China, he is an ideal candidate for cooperate communication lecturing in the East Asia region.